Chapin was built in 1901 with a $30,000 gift from Dr. Daniel K. Pearsons and run by the Women's Educational Aid Association (WEAA) with the promise that Northwestern provide land for the building and that the WEAA be given control over the place. The university agreed and construction began in 1900. At the dedication ceremony on Friday, October 11, 1901, the 91-year-old philanthropist proclaimed, "I have built this building to honor one of the best women I have ever known. She died last March, having been an invalid for seventeen years. During these years of suffering, she gave liberally to educate the poor. . . in her memory I name this building Julia A. Chapin Hall." Julia was the sister of Dr. Pearsons' wife, Marietta. She was "a liberal friend of education [and] a pupil and believer in the system of Mary Lyon of Mt. Holyoke," who had preached the benefits of cooperative living. In fact, the WEAA had bought a dorm with the help of Pearsons in 1872. In exchange for the inexpensive room and board, each resident contributed an hour of work each day "in cooperative effort." The goal was to help young women who could not afford room and board. Known as Pearsons Hall, this predecessor of Chapin stood on the present site of the Rebecca Crown Center. There was some discontent among the young ladies in Pearsons after the first sixty residents had moved into Chapin in 1901. While the new dorm had single beds for each women, Pearsons still had doubles. The Pearsons women soon got twin beds too, but thirty years later the entire dorm had to be given back to the university, along with the beds. The Great Depression crippled the WEAA's resources, and one of the two buildings had to go. The association had long poured money into the other building, Chapin. In 1913, the second floor parlor was removed to the "delightful social room of the first floor." In 1924, the WEAA provided the dorm with a new refrigerator and gas stove. " The machine age was becoming delightful," one WEAA member recalled. During the WEAA's control of Chapin, daily life at the hall was directed by a Head Resident or Preceptress who granted permissions, acted as a chaperone and watched over the sixty female residents. 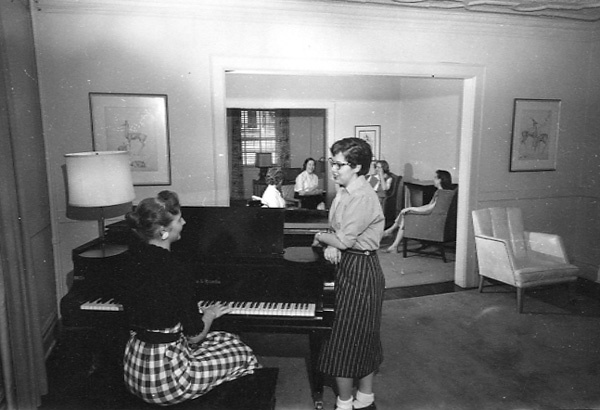 The residents held afternoon teas, receptions, and dinners for faculty and members of the WEAA, who often "spent delightful evenings enjoying music and readings by the young women." The WEAA always jumped at the chance to brag about Chapin. In 1942, Chapin won the Homecoming Skit Contest, with all sixty girls participating, and the group later presented their act at Fort Sheridan to the men in the service. Many of the young women won numerous campus awards and honors while living at Chapin. One former Chapino, Dr. Olga Jonasson, who lived in the dorm from 1958-1960, later became chief surgeon at Cook County Hospital. In 1966, a financial dispute centering on an $51,355 plumbing and electrical bill had soured relations between the association and the university. The WEAA didn't feel responsible for the bill, and neither did NU. Such animosity had roots early as 1935, when the WEAA had been unhappy that the university had not offered them a break on charges for services such as heat and plumbing. The WEAA, unable to deal with increasing costs and pressures of running Chapin, gave control of the building to Northwestern over Christmas break in 1967. NU converted Chapin to a regular women's dorm the next fall, although the WEAA continued to provide some of the residents with scholarships. From the fall of 1968 to the spring of 1979, Chapin Hall was run as a dorm for women. In the fall of 1979, Northwestern gave the dorm to the Humanities College, a move which caused some controversy. Soon enough, though, the residential college developed a character of its own, which has evolved into the institution that Chapin is today.